Baranof's Cook Your Catch ideas and options. Many of our guests arrive in Ketchikan with the desire to have a "True Alaskan Experience". Bear's digging through your trash at night, getting used to 170 inches of a rain a year, and paying a buck fifty for something off the "dollar menu" certainly fall into this category, but we wanted to offer a bit more. Baranof Skiff Excursions was built on a wilderness fishing adventure where our guests target bottom fish, then have them prepared with our restaurant's gourmet accoutrements out at a wilderness campsite.  The Cook Your Catch program expands on the idea to offer multiple dining locations where a meal featuring your fresh fish can be prepared and eaten. Ask any newcomer to Ketchikan: one of the top ways locals will welcome you to our community is inviting you to their home to enjoy lively conversation, a cold brew, and a home-cooked meal featuring their latest catch. Be it maple-glazed salmon served on a bed of rice and locally-harvested sea asparagus, crab-stuffed halibut baked with finely sliced onions and garlic, battered and fried lingcod dipped in a homemade tartar sauce, or a pile of prawns grilled to perfection, you’ll find the locals eager to share the bounty of our oceans. And, trust us: there is nothing—and we mean nothing—that compares to the taste of fresh-caught fish prepared within just hours of the catch. Most of us will be quick to tell you there is no meal better than the meal you share with friends and family after a long day out fishing. We doubt you’ll be surprised that here at Baranof Excursions we’re right in culinary step with any good Southeast Alaskan. With us, your fishing experience doesn’t stop after you’ve reeled in your catch. 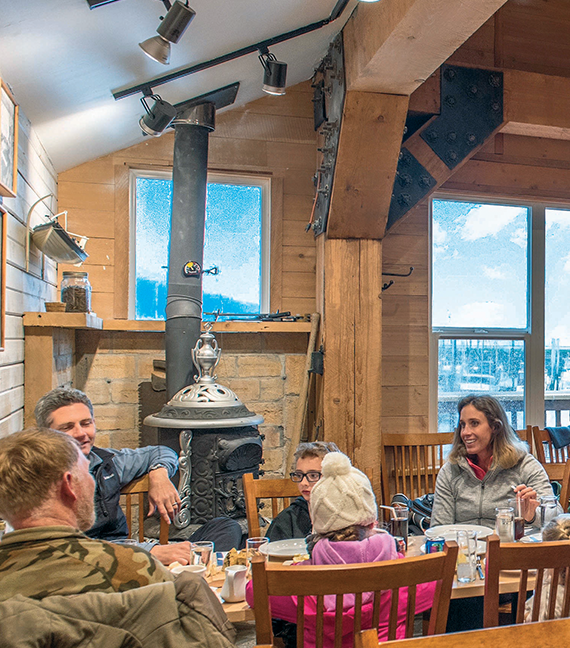 In our opinion, the ultimate denouement of your Alaskan fishing adventure is in savoring the fruits of your labor in an authentic Alaskan dining experience. We are experts and find enjoyment in taking your fresh fish, putting you in a unique environment, and opening the way for you to break bread with your friends and family. On arrival back to town, our guides will lay out your fish at our fish cleaning station and help you determine which fish you want to eat and how to prepare it to best meet your culinary desires. Once you’ve made your choice, we’ll run your fresh catch up to our chefs in the Alaska Fish House. By the time, you’re done taking your raingear off, washing your hands, and getting back into your civilian clothes, we’ll have a private table ready for you in our rustic-style dining room, and an expertly prepared meal on its way. Once you’ve settled at your table, enjoy a cold, Alaskan brewed Denali beer or a glass of wine to accompany your meal, and give yourself the chance to relax into an authentic Southeast Alaskan dining experience. (If you'd like, we encourage you to invite your family members that you left in town, and share in your catch). You caught them, you cook them. 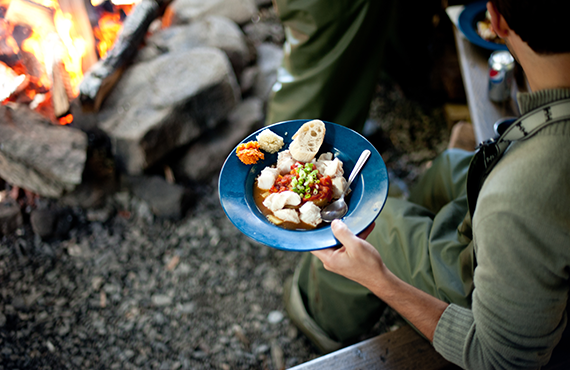 An Alaskan meal is better when the fish you're eating is your own catch. It's just about perfect when you prepare it yourself. 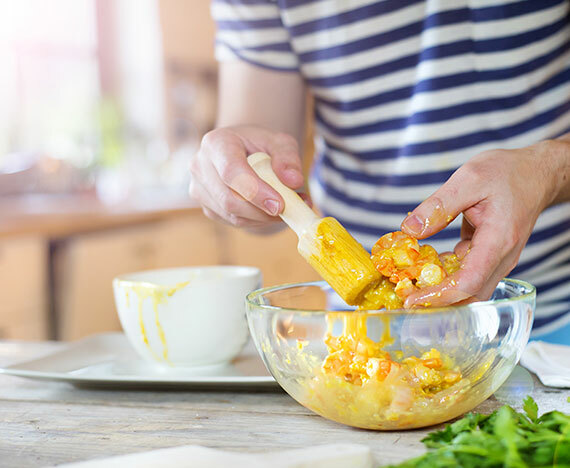 Whatever your skill level in the kitchen, we've got a recipe that should suit your needs nicely; or provide the spark for your own creation. Check out the recipes we've developed at our Alaska Fish House restaurant here . You'll also find some of the sides we like to prepare that complement a meal of wild-caught Alaskan salmon or halibut. We want the meal to turn out as well as you do, so shoot us an email if you need any tips or tricks that aren't covered. 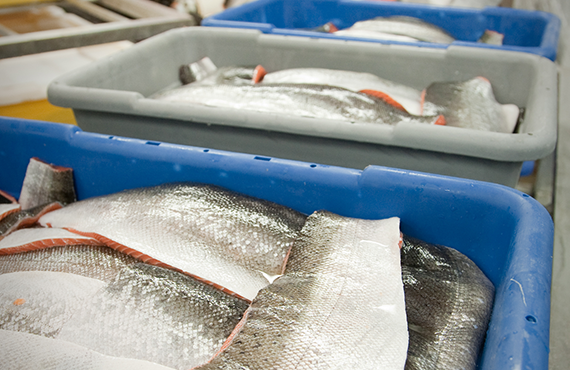 Do you have family members at home hankering for a taste of wild-caught Alaskan fish? We can package your fish in one pound, flash-frozen, vacuum-packed portions and send them FedEx Express so you can arrive home to the featured entrée of an incredible, home-cooked meal. Our suggestion? Wow your guests with our Alaska Fish House halibut Olympia or alderwood smoked salmon recipes. 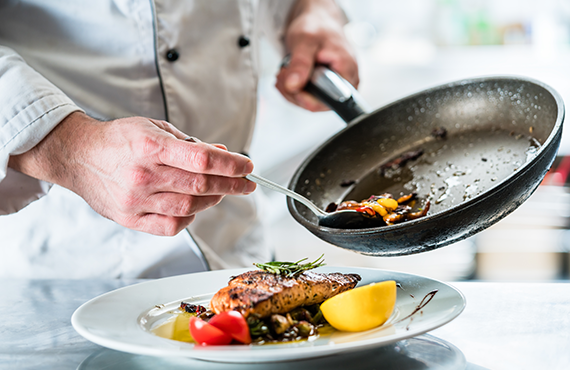 “Cook Your Catch.” If you’re traveling with Princess Cruiselines, you may want to opt for our partner program. Baranof Fishing will help you select your fish and box it up, and then you’ll take it to the gangway, where you’ll be met by a Princess Cruiselines professional chef. You’ll then have the opportunity to discuss your options for prepared dining and, later that evening, you will be served up your freshly caught fish for dinner, much to the envy of surrounding tables and cruiseline guests. Chef’s Market Discoveries. After several hours of fishing, you’ll come back to the Baranof Excursions dock where you’ll be met by our personal fish monger and the Celebrity Cruise Line chef. You’ll take photos of the fish, then talk in detail about the attributes of each—which is best for ceviche, baked, fried, or otherwise—and determine which fish you’ll dine on that evening and how it will be prepared. Not only will you return to the ship with bragging rights, you’ll get to enjoy an intimate, chef-hosted dinner featuring your catch of the day. "What People Are Saying About Baranof: Cook your Catch"
We came from Utah just to try to bring Halibut home, and Lukas with Baranof made it happen. He was thoroughly detail oriented and a skilled fisherman. Chuck (the owner) and his daughter and son were incredibly accommodating and showed top notch customer service. They also run Alaska Fish House, which serves delicious food at a fair price. The “cook your catch” fishing is a brilliant idea and the chef was spot on. 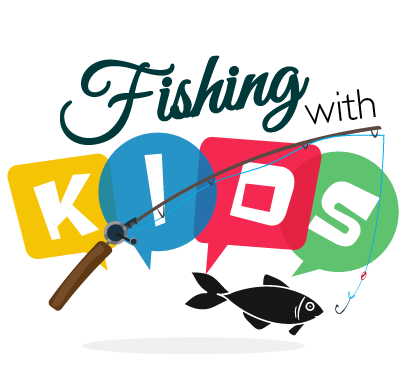 We had a grand time and we wanted to highly recommend this fishing guide service and restaurant. Don’t miss this on a trip to Ketchikan! 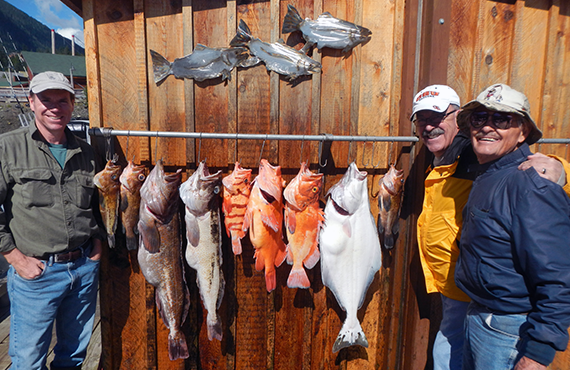 This was the second year that we traveled to Ketchikan to fish with Chris and Baranof Fishing Excursions.The trip was, as expected, nothing less than fantastic. Even though we were at the end of the king salmon run and at the very start of the silver runs, we caught our limit of halibut and rock fish. Chris is a really good guide and Baranof worked very hard to make sure that we had the great experience we were looking for. But the amazing part was that at the end of the fishing trip, Baranof offers a "cook your catch" experience where they cook some of your fish for dinner at the Alaska Fish House restaurant which is associated with Baranof and is located right at the dock. We have had the good fortune to eat at some amazing restaurants all over the world and the experience we had tonight eating our fish at the Fish House may have been the best seafood dinner we have ever had. How the Alaska Fish House lured Austin away from Seattle to come to Ketchikan will remain a mystery but please do not miss out. I am struggling to find the words to describe how good our meal was. Thank you Shannon for walking through the entire dinner with us and explaining how everything was prepared and why our taste buds are still in euphoria. If I had to choose between Paris or Ketchikan, we would eat at the Fish House and ask someone to send me a nice picture of the Eiffel Tower! Found Baranof online and found all the good things said were true. Went fishing with Matt Carlson as our guide and could not have been happier! We enjoyed his personality and knowledge so much that we requested him as our guide for all 4 days of fishing. Over 4 days we brought home 100 lbs of fish, including. Lingcod, halibut, king salmon, silver salmon, rock cod, cod, not to mention the huge halibut we could not take because he was in the no zone of over 38 inches and under 80 inches. Would definitely recommend Baranof AND the Alaska Fish house, and the cook your catch.